This relative of the herb Chervil produces dark purple foliage resembling the green foliage of the wild Queen Anne's Lace, its cousin. 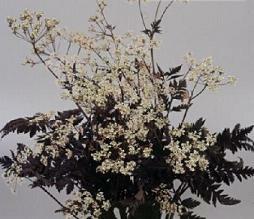 Blooms are delicate white lacy clusters. Both leaves and blooms make lovely fillers for arrangements or contrast to roses or other perennials in the garden. Anthriscus prefers a location in full sun, but can tolerate partial shade. Soil type is not very important, as these are very adaptable plants. They do not, however, like a location that remains soggy. The plant is easily propagated by division in the spring or by sowing seed. Sow seed in pots or trays and keep moist at 70F. Transplant seedlings when they reach about 2 inches in height. Transplant outdoors when temperatures no longer drop below 50F. Space 18-24" apart.